Are Hot Tubs Hard to Maintain? Posted on January 10, 2018 , in Hot Tubs. Hot tubs are a wonderful way to enjoy a spa-like relaxation retreat in the comfort of your own home as well as reap the benefits of their many wellness advantages. Often, when someone has decided to purchase a hot tub, one of the first things that come to mind is if hot tubs are hard to maintain and how much time will need to be spent cleaning. Below, we will outline the simple steps involved in hot tub maintenance and how to keep your hot tub clean. The self-cleaning technology in Hydropool hot tubs will purify, remove dirt and continuously filter the water in your hot tub. That being said, you will still need to occasionally change the water in your tub. Depending on how much usage your hot tub has received, it is recommended to drain and replace the water every 1-4 months. Certain visible water conditions such as foamy or milky water which can occur after heavy usage may also indicate that it is time for your water to be changed. When you are draining the water in your hot tub, it is the perfect time to clean the spa shell surface. Regular cleaning of the inside of your hot tub will prevent a build-up of oil and debris below the waterline, keeping your hot tub sparkling clean. To clean the shell, all that is needed is a soft damp cloth, however, if you do have any stubborn stains, ask your hot tub dealer to recommend a specialized cleaning agent that is safe and will not leave any soapy residue behind. Cleaning your filters regularly will ensure that your hot tub is functioning optimally. In addition to improving the lifespan of your hot tub, it will also keep your water hygienic and sparkling clean. Although it can depend on the model, it is usually recommended to rinse and clean your water filter every 3-6 weeks. To clean your water filter, remove it and rinse with fresh water before soaking in a specialized cleaning solution. Make sure that you allow it to completely dry before replacing. If you do not want any downtime with your hot tub while your filter is being cleaned, a second filter can be purchased to use while the other is receiving maintenance. Keeping your hot tub covered when not in use can go a long way in keeping it clean. In fact, keeping your hot tub covered is probably the easiest ways that you can prevent the water in your hot tub from getting dirty. A good, lockable quality cover will not only keep leaves and debris out of your hot tub but will also make your hot tub more energy efficient by trapping and reusing heat. Your cover will occasionally require cleaning as well. Every month or so, remove the cover and lay on a flat surface and rinse with running water to wash away any trapped dirt. Wiping the top of the cover with a non-abrasive cleaner or mild dish detergent will keep your coverage in great shape and looking like new. 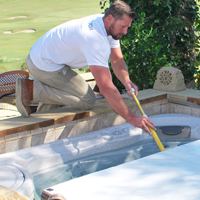 As far as routine cleaning goes, Hydropool hot tubs take care of almost all of the work. The cutting-edge pressurized microfilters will clean 100% of your tub’s water in just 15 minutes, as well as with vacuum the floor and use high flow water skimmers to keep the surface clean. The few tasks required by a hot tub owner to complete only take between half an hour to an hour per month. By staying on top of routine maintenance, you can rest assured that your hot tub will stay in great shape for years to come, providing you with enjoyment and relaxation anytime you wish. To learn more about Hydropool self-cleaning hot tubs, download a hot tub buyer’s guide today.